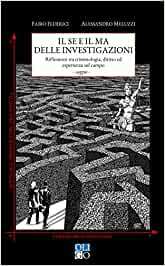 Description (from Amazon) Attraverso le diverse esperienze degli autori, questo saggio mette a confronto il punto di vista del detective e quello dello psichiatra criminologo. Il campo di indagine è il labirinto della lotta contro il crimine alla ricerca della giustizia e va a scandagliare il complesso mondo degli assassini (seriali e non). Per fare questo, si prendono in considerazione le menti dell'investigatore e quella enigmatica dell'assassino, per poi passare a valutare il ruolo cardine della prova logica nella ricostruzione della verità processuale; viene quindi indagato il ruolo del giudice e, infine, si prende in considerazione l'influenza dei mass media nell'odierno mondo della giustizia. Per evitare di entrare nel vortice dei "processi mediatici", che puntualmente accompagnano i più eclatanti casi di cronaca, l'investigatore moderno, nel difficile percorso verso la verità, deve farsi guidare dalla logica del ragionamento, basato su un rigoroso percorso multidisciplinare, tenendo sempre in mente i tre principi sub iudice, pro veritate, pro iustitia. My review: 3.5/5 This review is, as others on my profile, a "dual review", i.e. covering in part two books. The reason is that I do not look at the subject at face value- and, as I wrote in other reviews, the history of warfare (and crime history, in this case) often have a major advantage: the authors review known choices from multiple perspectives. The first book is Barbara Tuchman's "The Guns of August", about the inception of WWI. The other is one of the few about criminology written in Italian that didn't disappoint in its discussion about decisions-making. As you can see, both of the books are really about decision-making and avoiding various forms of bias. And now, the review about "Il se e il ma delle investigazioni". If you read few books about profiling (I did once in a while, to support the HR side of my change management activities), you also know that often all the technology we have at our disposal obfuscates the need of following some basic principles of logic. Most books on profiling discuss cases and results, often focusing on successful investigations. This book is divided in two parts: the first one, by Federici, a Carabinieri officer, is about both investigative principles and a frank discussion on the impact of the environment (e.g. media, bias). Instead of discussing just the investigative side, including profiling, this first part profiles also the full lifecycle of an investigation. Starting with the profile of an investigator, as, according to the author (I have no direct experience), in Italy we still lack a structured career development and training path similar to the one available e.g. in the USA. Continuing then with of course a step-by-step on the investigation and profiling of both victim and perpetrator(s), as well as of the decision making of the judge, and potential bias involved in each one of the roles. The second part is instead written by Meluzzi, a psychiatrist and university professor, who traces back most of the same points listed above, but from his perspective. Anyway, the book converges on a specific Italian issue: in our struggle to be considered an ordinary country, routinely we transplant in our laws elements extracted that are consistent with other countries' legal culture and customs. This includes the attempted adoption of the anglo-american investigative approaches. Professor Meluzzi is actually, by direct experience, even more critical of the Italian judicial system and the impact of reforms, including of the lack of balance between prosecution and defence, notably after media get involved. Overall, an interesting book on managing both bias and due process, in business as well as while dealing with an investigation or audit.